The training sessions of 504 Parachute Infantry Regiment of 82nd Airborne in North Carolina continue in 1942 as Company Aksu was given an order to keep control of the bridge with Company Eero acting as reserve initially located in the nearby village. Their opponent, company Janne, was ordered to engage the enemy and take control of the bridge. 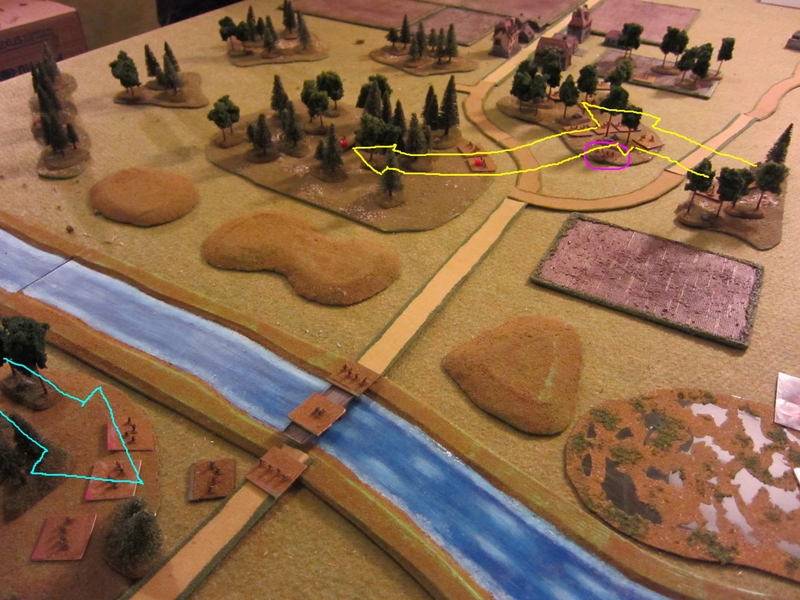 The attack was two pronged with two platoons (yellow arrow) assaulting the Aksu’s MG positions (pink) in the woods from the side and another, slightly delayed, assault with one platoon (blue arrow) on the units in the immediate vicinity of the bridge to tie them up. Company Eero surprisingly managed to immediately get busy when the alert on Janne’s attack came and thus, even though the MG bunker was quickly overtaken, the whole attack teetered on disaster against superior enemy numbers. Aksu’s units guarding the bridge immediately forsook their initial positions to give assistance on the hard pressed comrades in the woods which enabled Janne’s remaining platoon to take their positions in the wooded hill even if it was almost annihilated when Aksu’s units turned back. Meanwhile in the main engagement Janne, against all odds, managed to hold Eero back. The woods of the MG position witnessed some fierce hand to handcombat as both sides launched counterattack after counterattack and, if memory serves me well, the matter was finally solved between Janne’s and Eero’s company commander stands. At the same time Aksu’s troops were also pummeled into submission and received enough enough casualties to rout and thus company J won.